Skillsoft, a U.S.-based education technology company specializing in learning management systems for the training sector, will host its annual conference, Perspectives 2018, in Las Vegas from April 11-13. eLearning Inside News recently talked to Tara O’Sullivan, Skillsoft’s Chief Creative Officer, about the upcoming conference and this year’s conference theme: The Age of Learning On-Demand. 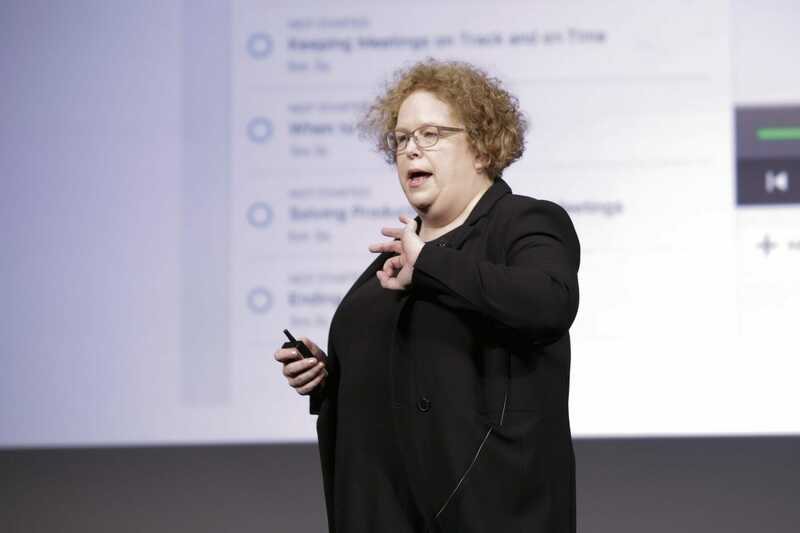 Cait Etherington: When did Skillsoft first launch the Perspectives conference series? Tara O’Sullivan: Skillsoft was founded in 1998, and the first Perspectives conference was held in 1999. This year marks the 19th anniversary of the event, but the major party will be next year in conjunction with Skillsoft’s 20th anniversary. Over the years we have had an incredible selection of speakers at the event – Peter Diamandis, Sir Ken Robinson, Heidi Grant Halvorson, Jack Welch and Seth Godin. CE: This year’s theme is “The Age of Learning On-Demand.” Why did you choose this theme and what does it mean for Skillsoft? TS: This came from us thinking about how to deliver frictionless learning to people. We know that people are used to “taking” training, but what if we could deliver training to the learner when and where they need it. So rather than asking them to ‘take a course’ you offer them the opportunity to access learning through their flow of work. Percipio ELSA is our new frictionless learning browser plugin, which brings all the power of Percipio to the learner, where they are and when they need it. This is also about leadership training – no longer can we have leadership training delivered to a select few on a 3 day facilitated offsite. We need to provide for the democratization of leadership – everyone, whatever level should have access to leadership training in order to make them more effective as a manager. These days, anyone could be asked to lead a cross-functional group for a specific length of time, and we need to give people the training needed for them to succeed. Especially when it comes to virtual, multi-generational teams, we need to ensure that leaders, at all levels of the organization are prepped. But the most important area is how this relates to platforms. Josh Bersin defines on-demand learning as the discipline of giving people what they need to learn, perform, and grow on the job. Percipio, our new intelligent learning platform, and SumTotal, our LMS, are extremely relevant in this area. Designed to meet the needs of the modern learner, Percipio allows them to take advantage of pre-curated channels, micro-learning courses, and offers the choice of where, when, and how to learn. Percipio has over 500 channels, with new channels and content being added all the time. Percipio delivers an intuitive design to engage learners, with a consumer-led experience to accelerate learning. SumTotal Learn connects the dots between the skills and competencies people need to be better at their jobs –delivered in the context of what they are trying to accomplish – and, prepares the organization for tomorrow, to measurably improve performance. CE: Who are your keynote speakers and how will they speak to the conference theme? TS: Every year we match our keynote speeches to people who we thing can talk about the major challenges our customers are facing. We have an outstanding lineup of keynote speakers including Josh Bersin, principal and founder of Bersin by Deloitte. His session “Learning in the Flow of Work” will show how micro-learning, macro-learning, and adaptive learning have come together to make learning in the flow of work really happen for an organization. Andy Cunningham, founder and president of the Cunningham Collective, will present, “What’s Your Positioning DNA? What Does it Tell You About Your Company, Your Positioning and Your Success?” She will share the importance of understanding positioning to make strategic decisions on branding, messaging and corporate values. Finally, Wendy Sachs, author of Fearless and Free: How Smart Women Pivot and Relaunch Their Careers, will provide practical guidance and lessons from those who have successfully learned how to redefine their skills and their roles in a climate of constant market and organizational change. CE: Several people at this year’s meeting will be presenting on workplace engagement, which continues to be a big concern for many people in business, but what are some of the other pressing issues that this year’s sessions will address? TS: It’s interesting, Employee Engagement is slowly being replaced by the Employee Experience. The Future Workplace and Beyond.com study found that 83% of HR leaders said “employee experience” is either important or very important to their organization’s success, and they are investing more in training (56%), improving their workspaces (51%), and giving more rewards (47%). The idea is that we think a lot about our customer “journey” but not a lot about what our employees experience. So now there are a lot of our customers mapping out the journey for their potential and existing employees. Talent acquisition has transformed in the last decade with skills shortage. This starts from the first communication when a prospective employee applies for the role. Your first impression lasts, so making the recruitment and onboarding experience positive and reflective of the company culture is more and more important in order to attract the right talent. In addition, you need to think about your existing employees, again, just as marketing departments have been thinking about their existing customers. We need to ensure that existing employees feel like they are getting the experience, support, and opportunities that they need in order to grow with the company. Another area of concern is Compliance–with the #MeToo campaign, the very public firing of CEOs and indeed in Google’s case, their entire culture of diversity called into question. Organizations need to demonstrate how they support diversity and gender parity and in some cases, prove it. Another issue is the involvement of women in leadership, how to ensure you have a balanced pipeline of leaders and what to do to support women in new leadership positions. Finally, a lot of our customers talk about how they have made their training and talent programs a success. Honestly, I learn as much at Perspectives as any other attendee – sitting in on customer sessions explaining how they make our solutions work with their people is fascinating. Who Should Attend Perspectives 2018? CE: Who should attend Perspective 2018 and why? TS: In the past, we tended to have learning and development people attending, as they usually were in charge of selecting vendors and launching the programs internally. But today, business managers have more say in the decision, which is a good thing – as they know their learners very well. We are starting to see more people attend who have more general remits within their organizations. Every Perspectives, we welcome HR Directors, Chief Learning Officers and Chief Human Resources Officers and they are very interesting in the strategy piece. They are interested in where we are going as a company, but also interested in hearing from thought leaders like Josh Bersin about where the industry is going and what major trends they can expect over the next 18 months. CE: Can you talk about some of your other forthcoming Perspectives events around the world? TS: We started to bring a shorter version of the Perspectives event around the world pretty recently. Last year we went to India for the first time, as well as returning to Australia after a two year absence. Our EMEA Perspectives is a key event for all our customers across Europe. We basically bring Skillsoft and SumTotal keynotes to these global events and also welcome local customers and partners to describe their experience. We have keynotes from local thought leaders, analysts and celebrities – for example in Australia we have invited Code like a Girl founders Ally Watson and Vanessa Doake to speak to our attendees about involving women in STEM. Rajeev Peshawaria, author of Open Source Leadership, will also keynote, and as well as being a best-selling author, he has served as the Chief Learning Officer of both Coca-Cola and Morgan Stanley. Going around the world to deliver our mission and vision to our customers, prospects and partners is exciting, and it is a great opportunity to check in with them. We do a lot of communication throughout the year, but this face to face event where all our key execs are present is a very compelling experience.